The Piper's Whim: A history of bagpipe making in England, Scotland and Ireland runs from 1-31 August at St Cecilia's Hall, Cowgate, Edinburgh. It is open Tuesdays to Sundays, from 10:00 until 17:00 and admission is free. The instruments, from Scotland, England and Ireland - bought with the help of the Heritage Lottery Fund - will become part of the university's musical instruments collection once the exhibition is over. The display, which opens at the University of Edinburgh on Thursday, will illustrate that bagpipes are not just a Scottish passion. Instruments from Northumberland and Ireland will be showcased alongside border, lowland and highland pipes from Scotland. Exhibits have been brought from England, France and the United States for the display. Others have been loaned by the National Museums of Scotland and Glasgow City Council. A Victorian walking stick, with a practice chanter at the top and a drone at the bottom, is among the more unusual exhibits on display. The instrument enabled men to play music while indulging in country pursuits. Other highlights include a set of ceremonial highland pipes - dating from between 1770 and 1780 - which belonged to the piper to the Duke of Montrose. A set of border pipes used by the piper to the Duke and Duchess of Northumberland will also feature. 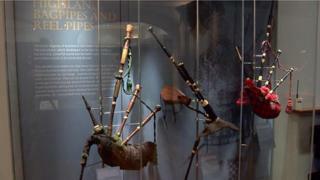 Some of the exhibits borrowed from international collections were made by the Glen family of Edinburgh, a celebrated bagpipe-making dynasty. Sarah Deters, the exhibition's curator, said: "The exhibition aims to give visitors a nuanced understanding of piping history in the British Isles. The instruments themselves have been far more varied than many realise."